Welcome to Married Life: Time to Play Outside! We've had a couple of cold and rainy days this week, but today was gorgeous again as befits our valley in the spring. Cory loves to be outside so it was hard to keep him entertained for two days inside. Especially since he's been sick. 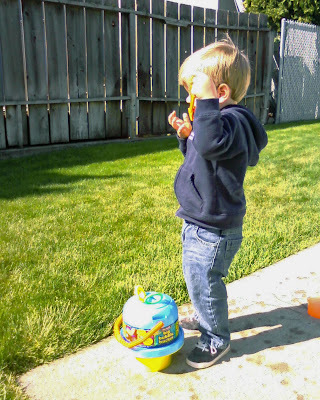 One of his favorite things to do is go outside and blow bubbles. He's been asking for them all winter. So it was great news when I was asked to review the No Spill Bubble Bucket from Time to Play Magazine. Unfortunately Cory is a bit young for this, but when he actually figures out how to blow bubbles without sticking his mouth on the wand it will be perfect! I was totally amazed at the design of the bucket. Unless your kid picks it up and quickly flips it 180 degrees you will get very little bubble solution coming out. Plus, there are three wands so kids can share! He tried really hard, but for now Mom has to do the blowing! Which means I actually have to be outside instead of watching from the kitchen window. Good for me too! 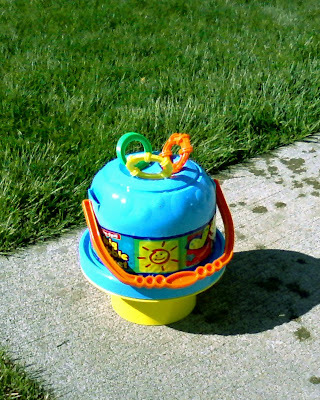 More info on the No Spill Bubble Bucket can be found about halfway down the Outdoor Play page at Time to Play Mag. Time to Play Mag is also sponsoring the SiteWarming party tonight (Friday) with toy experts Jim Silver (@jimsilver) and Chris Byrne (@thetoyguy) using the #OutdoorPlay tag. The party will be live on twitter from 6 to 7pm Pacific time and more info can be found at Resourceful Mommy where you can also sign up to win some cool outdoor toys for your kids. I am gonna look in to that bubble bucket. Emma accidentally kicked her bubble bottle the other day and spilled it all. She was so sad she cried.